"I rise to add to this debate today on the Carbon Pollution Reduction Scheme Bill 2009 [No. 2] and related bills. I am going to build on my comments on 3 June 2009, and I would encourage members who are interested in my broader thoughts on this to read that second reading debate speech when this issue was first introduced into the parliament. I want to add to those comments with this legislation coming back, because it is particularly important legislation in my electorate of Leichhardt, the home to the Great Barrier Reef and the home to the wet tropics rainforest. To us it is not only about protecting the environment and making a difference in terms of the reef; it is also about jobs in the tourism industry. We have over $2 billion in economic activity in the region based around tourism and there are 35,000 direct and indirect jobs. So when we talk about jobs and the need for us to take action on climate change, we are talking directly about regions like mine and the importance of tackling climate change. The science is in. There is no doubt that there are real risks to the Great Barrier Reef, the wet tropics rainforest, the Murray-Darling and the agricultural sector. The report brought down this week also highlighted the risk to coastal communities. I am proud to represent the Torres Strait Islands. Mayor Gela, representing the outer islands, is very concerned about the long-term impact of climate change and sea level rise on islands such as Saibai, Boigu and some of the central island group as well. It highlights how out of touch the opposition are when Mr Abbott in comments this week on the doors when asked about the report being released said that sea levels had risen 20 centimetres along the coast of New South Wales and nobody had really noticed it. The reality is that a 20-centimetre rise in sea levels in a place like the Torres Strait could mean that we would have to look to move people from islands like Saibai and Boigu. Members opposite making contributions like that in this debate really do not understand how important this issue to communities like those in the Torres Strait. Indigenous Australians are really struggling and thinking about the long-term future of those communities. I heard the member for Mackellar’s comments earlier. They struck as being quite different from the overall view that I thought the Liberal Party brought to this issue. The reality is that the Labor Party took to the last election a commitment to introduce an emissions trading system and we are now debating our emissions trading system, the Carbon Pollution Reduction Scheme. The member for Wentworth, the current Leader of the Opposition, made it clear that he supports an emissions trading scheme. As the environment minister in the former Howard government he introduced legislation into this parliament. There was discussion about it going to the former coalition caucus and being supported. The reality is that the Leader of the Opposition is on the record as saying that he supports an ETS. We heard the member for Mackellar say that basically she does not support this legislation and does not support an ETS, like many other members over there. But we have heard from the leadership of the Liberal Party that they do support this proposal for an emissions trading scheme. They might not like our particular emissions trading scheme, but they do support an emissions trading scheme. We are negotiating in good faith with them. But that sounds quite different from some of the comments from their back bench. The business community supports an emissions trading scheme. The Business Council of Australia and the Australian Industry Group support one. The National Farmers Federation reckon that we need to have an emissions trading scheme. They are saying—quite differently from the National Party—that they support an emissions trading scheme. They want to have the emissions out but they want to be able to take the benefits of the abatement. So there is a broad coalition that supports an emissions trading scheme. The NFF says that they want to see an emissions trading scheme. They want to see the benefits of abatement go to the agriculture sector. I come from an agriculture and farming background. I talk to local people in my part of the world in the sugar industry, and they see real benefits from being involved in getting the abatements that will flow if the Carbon Pollution Reduction Scheme, an emissions trading scheme, passes through the parliament. There is a broad coalition of people who want to see the government take action on climate change. There is international agreement. The American President has made it clear that he supports an emissions trading scheme. The Europeans already have an emissions trading scheme. There is a broad coalition of support that we need to get an emissions trading scheme in Australia through the parliament. We are negotiating in good faith with the opposition, but we are quite confused about where the opposition really stands on this issue. The Leader of the Opposition is saying very clearly that he now wants this legislation delayed until after Copenhagen. The reality is that Copenhagen is going to be important in terms of setting the levels of international targets. This legislation will be different, no doubt, from the American legislation and different from the European legislation—that is understandable; we have different economies. What we need to do is agree on the targets, and that is what Copenhagen is about. We and the Australian community are tired of listening to the Leader of the Opposition and other members opposite continuing to delay this debate and not making a decision. That has been their approach to this issue. I do not believe, and I do not think that anybody sensible who has been watching this debate, would believe that this is about them making a decision. This is about internal problems in their party. The member for Mackellar and a range of other members have made it very clear that they do not actually believe that climate change is happening. They are very sceptical about it. That is why they cannot make a decision on this issue. They were going to make a decision after the Garnaut report and tell us what their policy was. They were going to make a decision after the Treasury modelling and tell us what their policy was. They were going to make a decision after we had put forward a white paper and tell us what their policy was. They had their own Pearce report that would inform their policy and give us an idea about where they stood on this issue. Their opposition spokesman on this issue, Mr Robb, said that after the Senate inquiry we would get a clearer understanding of their position. And according to the Leader of the Opposition we would get a clearer understanding after the Productivity Commission report. Delay, delay, delay. It is not about the fact that the Leader of the Opposition does not support an emissions trading scheme; it is about the fact that he cannot get his own side of politics all together and into the room to agree. The Australian people are tired of it. They want a government to take action; they want this legislation through the Senate. We want to be able to go to Copenhagen with legislation that has passed the parliament and is very clear about how we can go about achieving our targets. We know that there are members opposite that support the view that getting this legislation through the parliament and through the Senate before Copenhagen is important. We want to show leadership to the international community. We want to make sure that we can get a good deal and set a high target so that we can keep carbon levels at or below 450 parts per million, which we need to do to make a real difference in terms of things like protecting the Great Barrier Reef. It could indeed help the outcome of the Copenhagen climate change talks if Australia agreed in advance not only to a carbon emissions target but also on a mechanism to deliver it. The government is prepared to sit down, through Minister Wong, and come away with a compromise if necessary to get this legislation through the parliament. But the Leader of the Opposition needs to stand up in his party room and take on the sceptics and get a deal on this issue so we can get it through the House and get it through the Senate and take to Copenhagen a plan to take action on climate change. People in my community in Cairns and Far North Queensland are demanding of the Australian parliament that we come together and come up with a solution to deal with the issue of climate change. Jobs are on the line in Far North Queensland in the tourism sector, if we do not take action. It might not be tomorrow but over the medium to longer term. My pleading and my call to the opposition is to come together and stare down the sceptics, stare down the National Party and come to an agreement with the government so that we can get this legislation through the parliament and take action and make a difference to the world in terms of our response to climate change. Oh what a nutter, he has the arrogance to go on about "Indigenous Australians are really struggling and thinking about the long-term future of those communities.." and he chopps funding for the rehad alohol centre in Cairns. In the lead up to the next Federal election watch as Turnour seeks to restore ALP credibility in Leichhardt. Speeches such as this are targetted squarely at voters in Redlynch Valley, Clifton Beach and Smithfield. He is being just like that other great ALP northern advocate Wettenhall; several months of being ya best mate then silence, total silence. The word Credibility and Jim turnour should never be used in the same reference. He is a total disgrace and you and Forsyth are so right. Sometimes when you are such an inept fool it is better to keep a very low profile. In that we can congratulate him but this speach is total hypocrasy and deserving of the ridiculing he will get from this Blog. Bring it on and let Jim know what we all think of him and at the next Election make sure this idiot is looking for a job back in the Public Service. A disgrace. As always on climate change a dichotomy twixt Jimbo and his somewhat controversial sister Jen Marohasy. Oh Jim, you are such a sorry blob of jelly, a wimp of a man. Your mumbo jumbo articulation is a segue to the person you are. Your speech was incoherent and poorly structured. The central theme was to attack the various opposition members. The solution to your errant style is to enrol in a series of elocution lessons. Furthermore, I suggest you write your speeches out and do not be so lazy and rely on off the cuff delivery. You are no orator! If Jim Turnour is so concerned about the Environment could I suggest he ceases breathing and leaves the Oxygen for other more intelligent and sensible people to utilise. Hi bloggers. 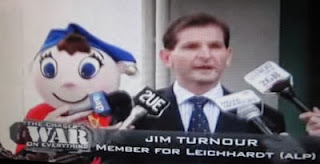 I agree with Ex-staffer that Jim "mumbo jumbo" Tournour is in need of elocution lessons. I believe that first timers should compulsory attend such lessons, if proven inarticulate by their peers. Sheeeesh, Jim Turnour needing elocution lessons?? Try standing near Warren Entsch when he's using "sh" words. "I won't SSSSHHHtand for THISSSSSSHHHHHH!" I SSHHHHHtand for SSSSHOME....."
Jesus Christ, you gotta mop your face after all that spray and asputim came flying out with the shhhhhhhssss". Then again there was the Brigadier, David ELMER FUDGE Thompson, former National Party Member for Leichhardt. "It's weally the wong fing to say....". I must say I laughed every time the Brigadier opened his mouth. Bloody amazing how people forget. Hehe, I agree, nocturnal c. You need an umbrella if you stand close to Warren and the old Brigadier was Elmer Fudd to a "T". Jim doesn't spit and dribble when he talks and he can pronounce his "r"s.
So, Kitchenslut, how does your comment help us and where does it take us? It guess it marks you, of course, as a person of the world, with insider knowledge and a snide view. We all find the different views of the baptist-born brothers Tim and Peter Costello a bit funny, and the rift between daughter Kirsty and dad Phil Ruddock was titillating for a while, but what is the relevance of Jim Turnour and his sibling being at odds on climate change? Who are you, and what do you siblings say? Don't get me wrong - I love your "insider trader" style. I enjoyed your unrestrained rants on this blog (which, you admitted, breached your own confidentiality undertaking) about the tender process for the Yungaburra pub. And I thought it was interesting that you - after time to digest your meal (and drinks) and reflect perhaps - later congratulated the successful purchasers. I also enjoyed your recent late Friday night post - which was exquisitely well-informed and accurate - about Richie Ahmat and his use of Cape York slush funds. I know your contribution was probably fuelled by a few vinos and the result of an ill-advised, lonely desire to trawl the local blog in the absence of any prospect of a root on Friday night, but I was disappointed that you subsequently withdrew it. Yes, it was irrelevant to the topic of Wild Rivers, and yes, it was outrageously defamatory, but you clearly knew what you were talking about. In the absence of anyone showing interest in your own blog, darlin', I hope you keep lobbing in your insider's contributions. They don't mean anything, except to reveal your inner delight at knowing who is who and a bit about any given issue, but it keeps you off the streets, I suppose. Thanks for the feedback Mick Mighell!! Can there ever be any flattery bigger than a critic obsessed?